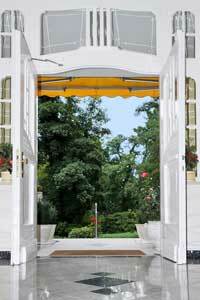 On behalf of Intus Hotels, I offer you a warm welcome to our 4 Star Park-Hotel Timmendorfer Strand. It is situated in the most renowned holiday area of the Lübeck Bay, at the Baltic Sea. Just around the corner is the peaceful spa park with ancient pine trees and abundant flower vegetation, and the well-known promenade with elegant shops and street cafes that offer an easygoing Sunday afternoon feeling every day. This is the perfect mix for people travelling on their own, for single people, married couples and families. You can enjoy a peaceful holiday while at the same time indulging in the lively atmosphere of Timmendorf Beach. Our hotel is run in a very personal way. Supported by my experienced team I am happy to pamper you during the most precious days of the year. To give you a flavour of what you can expect, I invite you to take the 360° tour. Our small lounge area is perfect to enjoy a relaxed chat in the afternoon, or to read a book and have some coffee or tea, just as you prefer. All rooms offer 4 star amenities, including wireless network. You may also want to relax in our wellness area. The place is well worth a visit at any season. 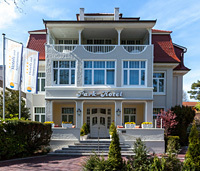 Located close to Lübeck, Fehmarn and Hamburg, our 4 star hotel at the Baltic Sea is the ideal base for exploring the many attractions of the area.